As record labels struggle to find new ways of selling music in the digital age, some companies are clearly more confused than others. Take Sony, for instance. It owns 50% of Columbia Records, the oldest and most venerable name in recorded sound. Columbia's co-chairman, Rick Rubin, has joined the list of music industry executives who think that an online flat-rate subscription service is the way to combat digital piracy and file-sharing. "You'd pay, say, $19.95 (£10) a month, and the music will come from anywhere you'd like," he told the New York Times earlier this month. "In this new world, there will be a virtual library that will be accessible from your car, from your cellphone, from your computer, from your television." Unfortunately, no-one shared this joined-up vision of the future with Sony Corporation bosses, who announced just days earlier that they were closing down the company's download store. The decision comes as part of what is, in effect, the wholesale scrapping of Sony's entire digital music strategy. 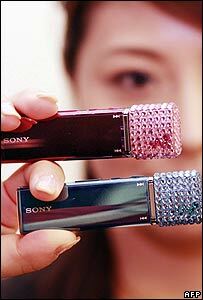 Until now, Sony's digital players had been primarily designed around its proprietary Atrac audio format, although initial Atrac-only players were replaced three years ago by ones that would also play MP3 files. Now it is getting rid of Atrac altogether and phasing out its Sony Connect music store from March 2008. Future Sony players will handle a range of formats, including Microsoft's Windows Media Audio (WMA). But how likely is it that somone will realise Rick Rubin's vision of an all-embracing legal digital music service? Well, there are currently two types of online subscription model on offer, neither of them exactly what Mr Rubin has in mind. 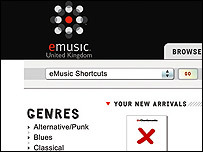 One is available from eMusic, the world's number two digital music service with 10-11% of the market. For a monthly fee, customers have the right to download a certain number of songs in MP3 format without any digital rights restrictions. Music lovers can choose from 2.9 million tracks owned by 20,000 independent labels. The snag is that none of the Big Four major record companies - EMI, Sony BMG, Universal and Warner - are included. The other is offered by a number of different firms including Napster, once a byword for illegal file-sharing and now one of the internet's best-known legitimate services. Under this system, consumers essentially rent their music. For a monthly fee, they can download as many tracks as they like, but the music sits on the computer's hard drive and cannot be transferred, although there is a more expensive service that allows copying to a compatible player. The music lasts only as long as you keep paying the monthly subscription. After that, the licence expires and the tracks become unplayable - unless you can crack the Digital Rights Management (DRM) that controls them. The chief executive of eMusic, David Pakman, is understandably keen to exalt his company's system over any other possible kind of subscription. But he swiftly points out the flaw in the "Rubin model" of music service. "Per capita spending on music in the US in 2005 was $24 a year," he says. "Music as a utility would pre-suppose that Americans are prepared to spend more on music than they did then, but speculation is that it's somewhat less than that now." 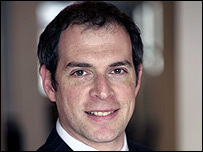 In other words, Americans probably spend in a year on music what Mr Rubin would like them to spend in a month - and there is no reason to believe that people in the UK or elsewhere are any different. In any case, as far as Mr Pakman is concerned, his customers simply don't want what he calls the "jukebox-in-the-sky" version of music subscription. "We are a business that's really focused on customers who are 25 years and older," he says. "We have a subscription-based system in that consumers pay monthly, but they are buying a pre-set number of downloads. "Every song, you own and can keep forever. Our age group still thinks of music in an ownership capacity. They're not ready to think about a rental model. "I think it's a long-term view. It's quite possible that music will be a service, but that's really a model that's not been adopted by consumers." The main problem with subscription-based services is that the leading name in music downloads, Apple's iTunes, has managed to corner two-thirds of the market without resorting to them at all. With most tracks retailing at 79p each and albums at £7.99, Apple is doing so well selling digital music as goods that the idea of music as a service still seems a long way off. But as sales of virtual music rise, traditional record shops are looking increasingly beleaguered. David Killington calls virtual music "digital air"
In the UK, there are only two national chains of High Street record retailers left after a number of high-profile casualties. One of those, Virgin, has just changed hands and is to be rebranded as Zavvi. Smaller shops, too, are going under - yet some store owners may still have the last laugh. 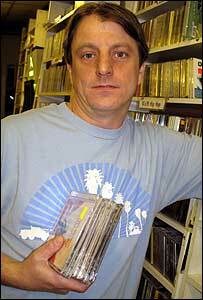 David Killington is closing down his Mr CD shop in London's Berwick Street, as reported by the BBC News website in June. But as he says, there are drawbacks to owning all your music as digitised information instead of physical artefacts. "When [bad] times arise and you need to raise some cash, there is always a chance to sell off some rarely-played discs that can be sacrificed from your collection," he says. "With buying downloads, you are purchasing digital air without any resale value whatsoever." The idea of music subscriptions is not going to go away, and many in the music industry are hotly debating how to make it work. 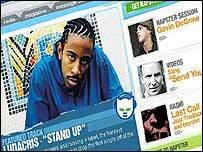 The latest suggestion, from Universal Music Group, is to make people pay through their internet service providers for the right to swap music. But pricing levels will be crucial - or else the cost of "digital air" could well leave consumers breathless.